On March 29, 1968, Dr. Martin Luther King Jr. traveled to Memphis, Tennessee, in support of black sanitary public workers that were on strike for higher wages and better treatment. On April 3, King addressed a rally and delivered his "I've Been to the Mountaintop" speech. King was booked in Room 306 at the Lorraine Motel. King and his entourage stayed at Room 306 so often that it was known as the "King-Abernathy suite." Ralph Abernathy was a good friend and leader of the American civil rights movement. 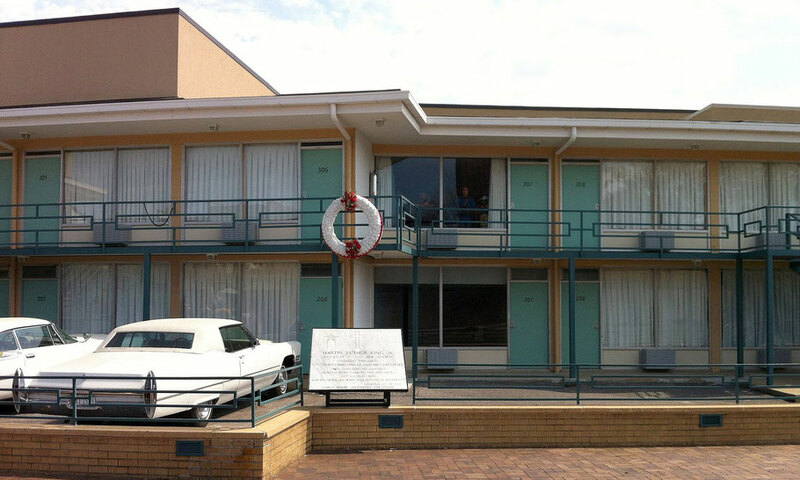 The next day, on April 4, Martin Luther King, standing on the balcony in front of room 306, was shot by James Earl Ray, a white supremacist. He was only 39 years old. After his assassination, riots broke out in 60 American cities, with 39 deaths. The funeral of King was attended by 150,000 people. Lorraine Motel stayed open until 1982, and in 1991 the National Civil Rights Museum was opened. Since 2001 also the building from where King was shot, is part of the museum.